Saturday, 7th July is the day when world no.3 Polish Agnieszka Radwanska steps on the Wimbledon Centre Court for the first time and becomes the first Polish player to play a Grand Slam final in 73 years when Jadwiga Jedrzejowska lost in the women's title match at the French Championships in 1939. Radwanska can become the world no.1 player if she can stop 6th ranked American Serena Williams from winning the Wimbledon title for the fifth time - and win it for herself for the first time. Serena, who has been to the Centre Court playing the final seven times before, is now aspiring for a name in Wimbledon history to have won the title FIVE times - an honour already shared by British Charlotte Cooper Sterry and British Lottie Dod, both of the Amateur Era, and of course Serena's sister Venus Williams. Venus last won the Wimbledon title in 2008 beating sister Serena Williams - Serena clinched the title from Venus the following year. 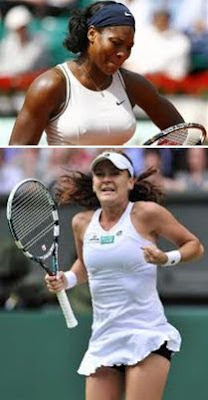 Radwanska has met Serena twice at Berlin 2008 and Wimbledon 2008 in the fourth time, losing both times to the American. Serena moved to the finals in amach between former world nos.1, herself and Victoria Azarenka beating her 6-3, 7-(6). Radwanska beat 8th ranked German Anglique Kerber 6-3, 6-4. Now it is between two aspiring women: One eyeing her first Grand Slam title ever and for her country since 1939 and the other eyeing to hold the Venus Rosewater Dish for the fifth time. Whoever wins, goes down in history. Watch this crucial and history making final on Saturday 7 July on the Centre Court. Thanks for the link. I think that blog is pretty interesting as in showcases posts instead of blogs. Well this one sounds pretty interesting! I love checking out all these reviews because it gives me new things to read! I recently came across your post and have been reading along. I thought I would leave my first comment. I don’t know what to say except that it caught my interest and you’ve provided informative points. I will visit this blog often.